Blog Tour with Excerpt, Giveaway & Review! 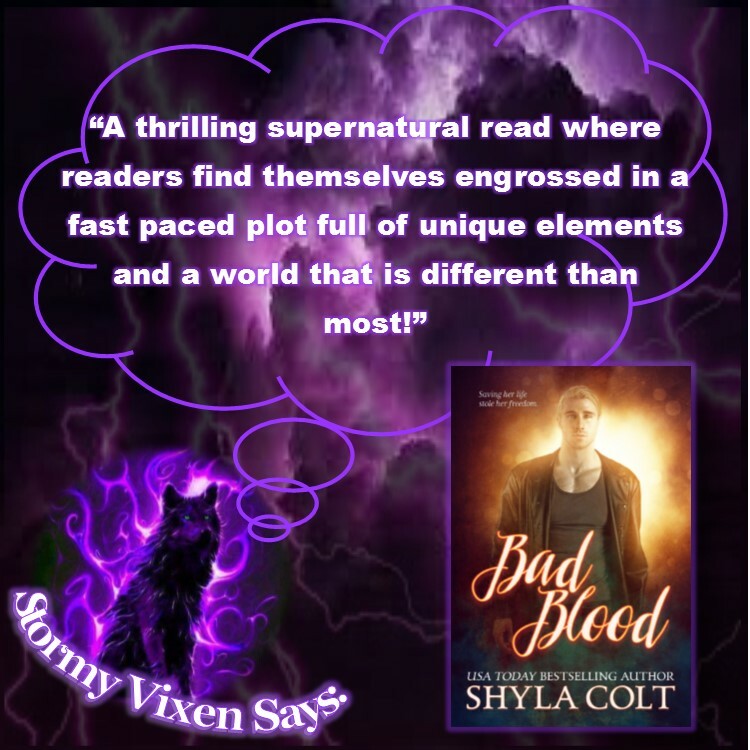 Bad Blood (Bad Duology #1) Shyla Colt! A freak accident thrusts Nakeeta Alva into a dangerous world of secrets, ancient spells, and a legacy she never wanted. The last in a magical line, she’s tasked with restoring the balance to a supernatural world poised for ruin. Tasked with the care of their savior, Crewe’s main focus is survival. Used to giving orders, the knight isn’t prepared for the sassy witch’s mouth or her lure. The powerful woman reminded him of his humanity and challenged his beliefs. Keeping her safe is his mission, but the real danger may be losing his heart. Together, they will save the world … or die trying. The first book in the Bad duology is a thrilling supernatural read. Keeta and Crewe easily draw readers into their story where readers find themselves engrossed in a fast paced plot that is full of intriguing elements and a world that is different from most other books. The romance is full of suspense, action and passion as Crewe sets out to train Keeta for the part she plays in a prophecy to restore balance to the new world that she has been thrust into. The attraction that they try to deny steadily grows the more connected they become but both are a bit unsure where it will lead which keeps the emotional turmoil high as it piles onto the danger they face, the secrets that are revealed and a legacy that Keeta never wanted. There is never a dull moment to be found throughout the story as it starts off with adrenaline filled event and continues with lots of action and suspenseful events as their enemies try to stop them and betrayals and surprises keep the couple on their toes. The story concludes with a very exhilarating battle but readers should know that it doesn’t end there as the battle will continue in the next book where the characters set off to find the others that involved in the restoring the balance and I am looking forward to finding out what happens next. 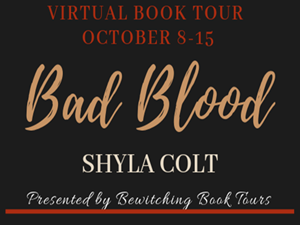 Bad Blood is the first book in the Bad Duology! The crack of thunder, proceeded by a bright flash of lighting, drew her attention from the words that swam on the yellowed pages in front of her. Her skin prickled. Hairs begin to rise, and she shifted in her seat. “This storm is wrong.” She whispered. There was power building up behind the weather or perhaps causing it. She stood and walked from the table, pressing her nose to the cold glass like a child. “Who knows we’re here?” Nervous energy added to her anxiety. Clouds raced over the sky, blocking out the full moon. A slash of lighting exploded, turning the clouds an eerie neon green. Swirling fog crept over the grounds. “Wrong in what way?” Crewe joined her to watch the abnormal display. “It’s unnatural? Can’t you feel it?” She opened their link, letting her emotions bleed into his. “I’m not sure.” The words felt like a lie. People didn’t work this kind of magic for shits and giggles. She smiled sadly. “There’s no place you can hide from magic. It’s specific like that. Standing your ground, and hoping you have enough magic to equal or overpower the other person is all you have. Focus. This is no novice.” Lighting struck the ground close to the castle. She twitched. It struck again closer, turning up the ground. A wind tunnel began to form. The base as dark as night. The evil feeling of black magic crawled up her spine. She knew the signature well. “If she did. She never would’ve let me go.” She rubbed her arms to counter the chill setting in. Saline blurred her vision as she nodded. A boom went off directly above the house. The rumble seemed to shake the ground. “I have to.” Her gut pulled her toward the front door. She turned, and the hem of her deep pink dress skimmed her toes. Better to remain barefoot, so she could tap into the earth's energy. Unlike tears before, she felt no fear. Calm descended over her as she made the long trek through the castle at a leisurely pace. Let her wait. She no longer owns you. The voice inside enhanced her confidence and helped snap the lingering chains that held her tight to the way things once were. Once you’d given your submission to a person, it was hard as hell to take it back completely. She latched on to the sweet nectar and sucked it down in greedy mouthfuls. His power charged her like a battery. The wound healed and she pulled back, licking her lips. Centering herself, she used her power to push the heavy door open and stepped into the howling winds, head held high. Her feet padded along the wet stone as she moved toward the grassy knoll where a figure stood in a black dress, shrouded by darkness. She knew all the intimidation tactics, so she dismissed them. Genevie might be using the same old tricks, but she had a new bag of them to unleash. Shield lifted, she flinched at the lighting strikes raining down on either side of her. The ground shook under the onslaught. She stumbled as the earth rocked, but never fell. Using her newly gained speed, would be giving away her hand. For now, she’d play the role to gather as much information as possible. Genevie threw back her hood and scowled. Her slender oval-shaped face was every bit as flawless as she remembered. No wrinkle dare mare her forehead or around her deepest black eyes. Full lips painted black turned down. Her eyebrows drew together as she looked at her with disgust. “Here I stand in plain sight.” Keeta held up her arms. 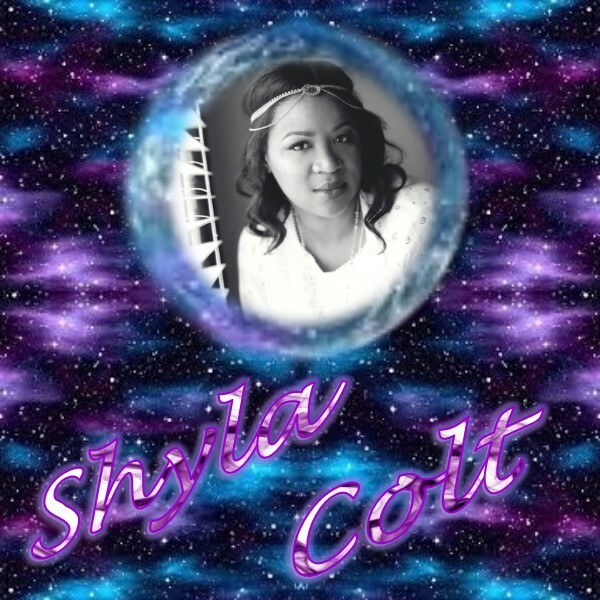 Shyla Colt is the sassy USA Today Bestselling author of the popular series Kings of Chaos and Dueling Devils M.C. This genre-hoppers stories feature three of her favorite things: strong females, pop culture, and alternate routes to happy ever after. Listening to her Romani soul, she pens from the heart, allowing the dynamic characters, eccentric interests, and travels as a former flight attendant to take her down untraveled roads. Born and raised in Cincinnati, Ohio, this mid-west girl is proud of her roots. She used her hometown and the surrounding areas as a backdrop for a number of books. So, if you're a Buckeye, keep an eye out for familiar places.